Connecting and exchanging data with a PX-4 or PX-8 (HX-40 or HX-80 if you are in the USA) has always been a bit of a problem. 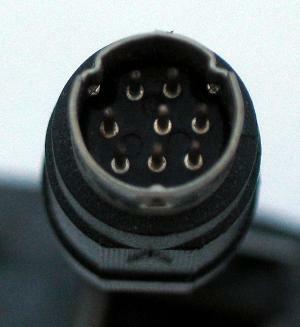 You had to find or buy a special cable from Epson or solder one yourself. Nowadays some extra complications arise; the Epson file transfer software runs on DOS only and serial ports are scarse on modern machines. The PX8vfs floppy emulator only works properly on 80486 class machines and lower and have a 16550 style UART. The latter may be solved by tweaking Dosbox, the former is solved here. transfer files using the FILINK protocol via the RS-232 port; Use the PX-4/8 RS232C port for this. See the Filink page for more info on this. 'print' files via the SERIAL port; Use the PX-4/8 SERIAL port for this. utilize the PC as floppy emulator using the epsp protocol; Use the PX-4/8 SERIAL port for this. During startup a message is send over the SERIAL port, so the PX-4/8 knows what is connected and sets the Baud rate accordingly; printer: 4800 Baud, floppy-terminal: 38400 Baud. At the left is a image it the contraption I occasionaly assemble to connect a DOS PC to a PX-* for usage with FILINK. All this could be incorporated into one special cable, but if I made a custom cable for every application, I would need a lot more of them. 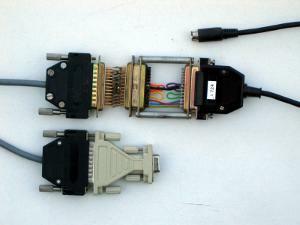 On the right the Epson #724 cable. Then a DIY null modem, a gender changer (F-F), a straight 25p. cable and finally a 25p. to 9p. converter (25M-9F). Some more info on Filink and null-modem converter. The contraption also works with the simulator, but on my modern PC with Linux, there is no serial port. On the right again the Epson #724 cable, a 25p. to 9p.converter (25F-9M), a level shifter, a USB-serial breakout board and a USB cable (mini-B to A). USB-serial converters are available, but you need a gender changer and null-modem too. 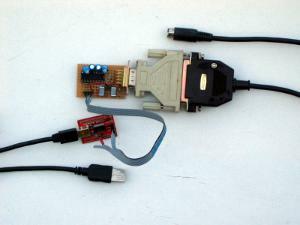 A more modern and compact solution is a commercial Serial-to-USB converter and a simple conversion cable. I bought the Serial-to-USB converter from Sparkfun as "USB to RS232 Converter", but there might be (cheaper) others. The short cable is custom made. It is a special variant of #724; "#724-F9". The PX-4/8 requires some special voltages on the handshake lines, but does not provide those, so a full loopback is not possible (CTS, DSR and DCD require a negative voltage. RTS can be connected to DTR for a positive voltage). The handshake lines are a remnant from the times modems were mostly analog and signalled the state of the line with descrete signal lines. Since the introduction of the Hayes AT command set, these lines were only there to be backward compatible. For the PX-4/8 - PC usage, certainly when you use a real RS-232 port, it is better to loop them back, certainly at the PC-side. The PX-4/8 doesn't really care for the handshake lines.